With billions of people scattered all across the world, each one more different than the other, it’s a struggle to believe that majority of us share the same fears. In every language, every culture and community there is an unexplainable fear of what happens next. It can take some people their entire lives to realise what their purpose is, or why they’ve chosen the path they’re on. It’s an irrational, but consuming fear for most while the more fortunate of us have simply accepted the mystery and move on with their lives. Future Generations’ debut album (released July 2016 via Frenchkiss Records) is a lament to the daily struggle with finding individual meaning in an infinitely large world. The indie pop group from New York have successfully managed to capture this daunting uncertainty and channel it through a ten track, universally appealing debut album of the same name. Eddie Gore (vocals), Eric Grossman (guitar), Mike Sansevere (synth/percussion) and Devon Sheridan (bass) are writing beyond their years as they explore heavy topics such as love, loss and oblivion in an album composed for the most part in a crammed college dorm room during a restricting schedule of work and study. Although young in age, Future Generations’ songwriting holds an astonishing depth usually found in more mature, established artists. 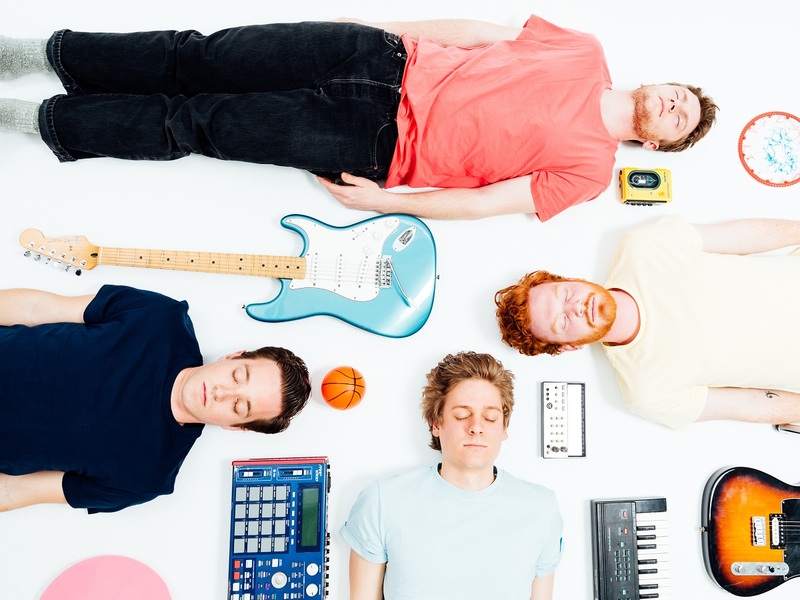 Stranger again, Future Generations have chosen the indie pop platform in executing their music, a genre generally reserved for simple Summer anthems and laments to young love and carefree youth. While the album does hold some of those clichés, certain tracks find the band veering into a darker side to their music, leaving lyrically remarkable tracks lost in an upbeat track of infectious hooks and harmonies. It could also be said that this was intentional, using the juxtaposition of feel-good pop and uplifting chord progressions against darker themes. This puts huge emphasis on the irony involved in dealing with anxiety where those happiest on the outside can often be quite troubled on the inside. Future Generations deal with this, amongst many other themes throughout the course of their debut. Don’t be fooled by the opening track “Grace;” a synthetic, almost hypnotic symphony of modern sounds with Gore’s crooning vocals mirroring that of Arctic Monkeys frontman Alex Turner. While it’s not the best representation of Future Generation’s more comfortable sound, it is a fine example of where their lyrics sit best, an appropriate backing track for their work. Out of the entire album, this song feels most suited to a band like Future Generations; where music and lyrics tie together neatly without an air of confusion. “Grace” also introduces us to the retro, 8-bit effect added by Sansevere’s synths which will be discussed in further detail later on in the album. “Stars” is possibly the most commercially successful track on the album, recently performed by the band on YouTube’s popular BalconyTV series. Its catchy tune and fast-pace mask its hidden depth as Gore sings of the irrational fear of exposing himself to the outside, calling out to a loved one to help him conquer these fears. ‘If you come to me close, we’ll cut the cable to outside.’ Gore pleads in the chorus, bringing the listener along with him on a journey to stepping up and conquering your invisible barriers. The line ‘I will tell you I’m alright but maybe more inside,’ Takes us back to the aforementioned metaphor of masking the fear-riddled lyrics with indie pop versus slapping on a smile when you’re shattered inside. This is an interesting method and certainly an effective one in the development of this album. In a Two Door Cinema Club-esque concoction of punctuating piano chords and a repetitive chorus, Future Generations compose a song of new beginnings and fresh starts, “Rain.” The song itself is quite aggressive with the harsh, almost whiplash-worthy drum beat conveying a bottled up anger, or frustration making this quite a tension-filled listen. ‘I just can’t wait till it pours/I just can’t till it rains.’ Gore sings, desperate for the weather to wash away all his worries, fears and mistakes. “Rain,” like many other tracks once again explores the struggles of anxiety and living with regrets. It’s unknown whether Future Generations are taking from their own personal experiences or speaking out on behalf of others. Maybe they just like the rain. The album takes a sudden drop to a slower pace for “This Place We Go, “a track venturing into love and loss and sentimentality. The introduction alone is slow and haunting, eerie in its echoing chords and dreary vocals. Still clinging to their pinch of happiness however, a more joyful guitar rift is layered over as Gore reminisces of his shared safe place with a loved one in the chorus while the verses rein-act a recent dispute over and over. Without conclusion, the track finishes leaving the listener with just the fading vocals of Gore and lingering piano chords, echoing to the finish, successfully capturing the themes of isolation and fear throughout the track. After the unorthodox approach to “This Place We Go,” Future Generations settle back into their consistent formula of lively instrumentals and catchy melodies in “You’ve Got Me Flush.” In this song, we take a look at the clever use of synth, mimicking the early sounds of the nineties in a bid to nudge our nostalgia with the 8-bit beat running through this love song. This method gives us a sense of Future Generation’s yearning for the past as they struggle to cope with the pressure of adulthood and growing older. Gore repeats the statement I know that I’ll be just fine, there’s a growing sense of uncertainty with every beat as Gore attempts to convince himself, more so than the listener, that he is capable of coping. Together the band manage to successfully encapsulate these daunting themes within a sound of innocence and childhood, as if the whole track could have been played with the contents of a young child’s toybox. This is another example of Future Generation’s sound/lyrics clash. “Find an Answer,” the key track of the entire album is a well-rounded, chart-friendly collection of cheerful, feel-good sound as Gore tackles all the pressing questions we’re faced with in life. The song could be described as an existential crisis anthem. What becomes of our lives, is my small obsession, Gore sings over an infectious rift and percussion-soaked rhythm that would set the scene at any Summer festival. All the main themes and queries of the album are all tied into one four-minute track making it a definite defining track of their debut. I’ve gotta make my mark/but the ink is fading’ It could be argued that this statement alone is the core purpose of the album, that this is simply Future Generation’s mark on the planet, a statement prove that they were here and questioned every second of the time they spent here. If this band were to release nothing more for the rest of their lives, this album would definitely suffice as a worthy mark. If you’re looking for a taster of what Future Generation have to offer, then this is the go-to track. The album concludes with “Thunder in the City,” a grand finale to the Future Generations experience. Being possibly the catchiest song on the entire album, it leaves a stamp on your mind that will have you humming it idly to yourself for the next week. While they keep to their running theme of anxiety for the most part, this track certainly takes a happier approach that serves as a satisfying finish to the album. While questions have gone unanswered and some may never be answered, this nostalgic lament will wipe whatever worries the rest of the album installed in your mind as the band play every trick in the book to dish out a feel-good track, even going so far as to break out a xylophone for the chilling pre-chorus. Thunder in the city is the second and most recently released single of the album and has the potential to climb to great heights in mainstream charts. Future Generations set out to define the modern struggles in their music and, while certain tracks do run a little wild and veer slightly off track, have successfully managed to create an album that stands as a mark of a generation. They have lived up to not only the album title, but their own name also, venturing bravely into unexplored themes and coming back with a fresh perspective on an age-old question. All the while they continued to experiment with various sounds and instruments showing not only their versatility as artists, but also their determination towards fine-tuning their voice and improving themselves for hopeful further releases. This is definitely not the last we will hear of New York indie group Future Generations.